When we were kids, my sister used to eat raw onions like they were apples. She would keep a sandwich baggy in the refrigerator with a peeled raw onion in it, every so often she would take out her pungent little treat and sink her teeth in for a huge bite to chew on. It was a spectacle on par with watching a circus freak swallow a sword. Her breath would reek of onion so bad it would make eyes water and flowers wilt. I love onions – not so much I’ll eat them raw like an apple – but enough to use them as a base flavor in almost every dish I make. 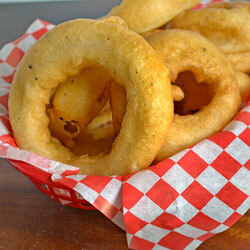 When it comes to eating large pieces of onion, I prefer them breaded and fried so they’re sweet and crunchy. 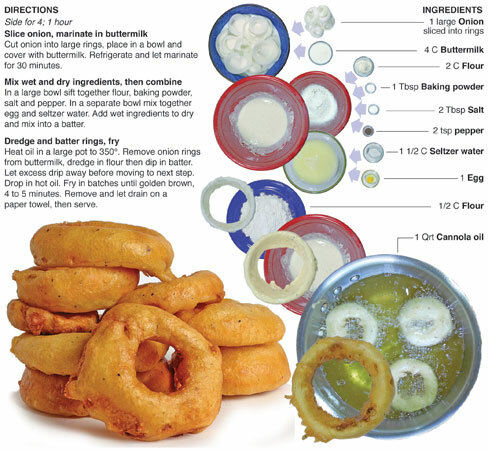 For this recipe, I make onion rings that are marinated in buttermilk, dipped in batter and deep fried. 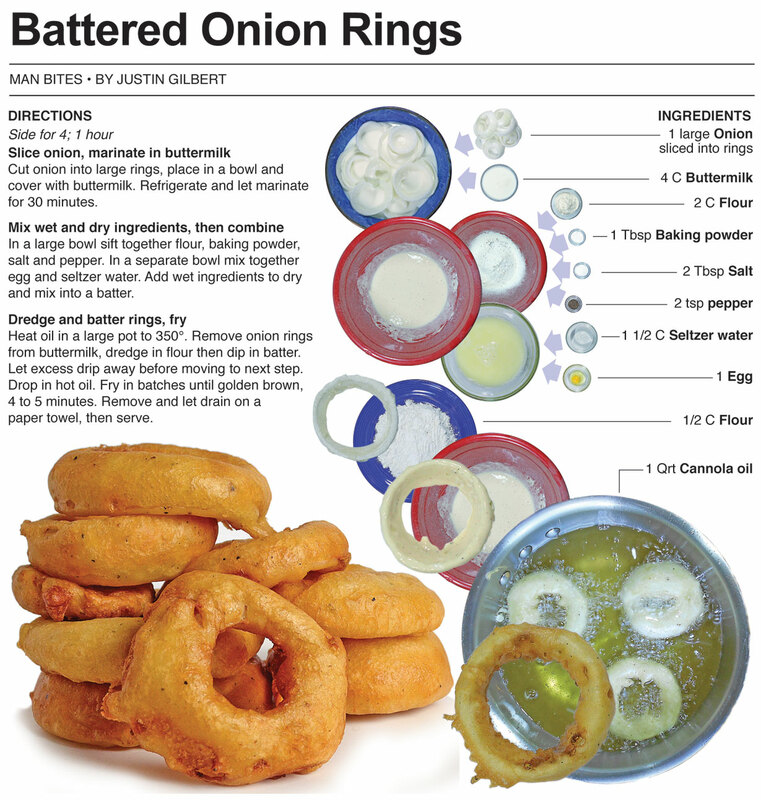 The coating for these onion rings is thick, fluffy and hardy – just a few are enough to make a great side for any sandwich. 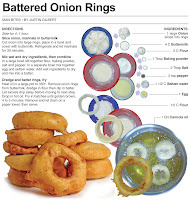 I’m sure my sister will approve of this onion ring as much as the raw ones she devoured when we were kids. When I was kicking around the idea of writing about my sister’s unusual taste for raw onion for the print column this week, I told my uncle about it. Instantly he perked up and said, “Onions were just one thing. She would go into the garden, pluck a vegetable out of the ground and eat it like candy.” I was surprised by his response. It was immediate, and he said it with genuine amusement. Not only was I amazed by my sisters eating habits when I was a kid but so were the adults at the time. She doesn’t eat anything off the wall or out of the ordinary today, but I wonder if she ever gets the urge to eat raw onions. Her kids have some unusual eating habits – they love sardines. I don’t know if that is unusual for 6 to 10-year-olds but they do seem to go bonkers when Grandpa breaks out a can with some crackers to snack on. I have yet to acquire a taste for sardines and I don’t know if I ever will, I think I’d rather take a bite of a raw onion.